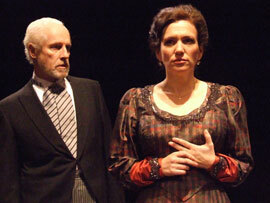 Catherine Eaton is a marvel as Hedda Gabler. Seldom do physical presence, acting ability and deep—not just superficial—characterization come together so completely. Consider the hands. Whether a lingering shake with fellow misplaced-person Eilert Lovborg (Matthew Semler), near-erotically stroking the gleaming auburn hair of author-emboldened Thea Elvsted (Kirsten Tripp Kelley), rippling her feline nails over a highball glass to regain the attention of her oblivious-to-angst husband George Tesman (Christian Brandjes), pointedly disparaging her spouse’s beloved Aunt Juliana’s (Kathleen Betsko Yale) precious new hat, unconsciously caressing her “lovely and plump” womb while other hidden truths threaten to emerge—most of those drawn out by Judge Black (Vincent O’Neill) as he morphs from contented “triangulator” to controlling master of the General’s daughter, Eaton belies the notion of “idle hands,” subtly employing them to sculpt every line given—heard or overheard—in a manner that compellingly fleshes out her performance without ever upstaging the supporting cast. Playing a musical instrument and brandishing a deadly one with, respectively, honesty and bravado is the artistic glaze to this richly crafted cake. All of that is only narrowly eclipsed by a range of tone, timing and visage—from frenetic rage to a one-word (“darling”) triumph over Gabler’s shallow shell of a mate—which creates a dynamic spectrum too seldom experienced in the theatre today (wild declamations are relatively easy; the courage to speak sotto voce is a risk few directors would allow). Fortunately for all concerned, director Derek Campbell wisely gives his lead a largely free rein to plumb the psychological depths of this desperate housewife and let devastation unfold as it will. To a person, Eaton’s co-actors eagerly fall under the spell of metaphorical infanticide and maniacal manipulation. Tom Makar’s sound design—most especially the delectable solo violin—is at one with the pain, passion and duplicity of the fabled heroine. The weak link is Andrew Upton’s “adaptation” which is far more a substantial variation on Ibsen’s much lengthier themes than a freshening for modern-age theatregoers. Sadly, because of the slimming down, the original’s proportion is thrown out of whack (er, off kilter in earlier times …) and the mystery surrounding many of the unanswered questions (most notably Gabler’s pregnancy) leaves too little doubt. An extra measure of bawdiness (“step down, stretch your legs”) cheapened rather than reinforced the sexual tension.